Simply put, Extra Virgin Olive Oil is the best quality and best tasting grade of olive oil. According to the International Olive Oil Council (IOOC), uality is determined primarily based on the acidity level (measurement of the free fatty acid content), and the positive flavor and aroma aspects of the oil. The sensory based flavor and aroma qualities, also known as organoleptic qualities are determined by an independent group of certified tasters. First cold press. This is a misunderstood and somewhat dated term. First: Except in the production of Olive Pomace Oil, there is no second press. Cold: Means that there is no excessive heat used in the oil extraction process. Press: While some traditional presses that squeeze the oil from the olives may still be in use, most producers use modern centrifuge based machines to grind the olives and extract the oil. Keep in mind that while all Extra Virgin Olive Oil is First Cold Pressed, all First Cold Pressed oil is not Extra Virgin. What about Peroxide Levels and Polyphenol Counts? While not part of the determination of Extra Virginity, there are several additional tests that also help measure quality, including peroxide level (measures oxidation levels), and Polyphenol counts. Low peroxide levels and high polyphenol counts are often desirable. Polyphenols are natural compounds, many of them antioxidants and anti-inflammatory agents. There are additional tests to determine purity. Olive Oil Classifications: As outlined by the International Olive Oil Council (IOOC): The level of Free Fatty Acids (FFA) is a kind of quality and freshness quotient. The lower the FFA percentage in an olive oil, the better the quality. During the process of evaluating the attributes of the olive oils, the IOOC also specifies an organoleptic evaluation (taste and smell) of the oils to help further classify Extra Virgin, Virgin and Ordinary Virgin Oils. Extra Virgin Olive Oil - Oleic acid is lower or equal to .8%, and there are no sensory defects. Virgin Olive Oil - Oleic acid is lower or equal to 2% and there may be some organoleptic defects. Pure Olive Oil and Olive Oil– Pure olive oil is oil that failed the parameters of Virgin or Extra Virgin, and must be chemically refined. The hexane based refining process removes all of the vitamins, nutrients and polyphenols in an olive oil while removing offensive flavors and odors, leaving behind pure tasteless oil. Products labeled Olive Oil will usually contain a small amount of Extra Virgin Olive Oil added to Pure Olive Oil. Olive Oil and Pure Olive Oil are healthy choices for frying and high temperature applications where Extra Virgin Olive Oil would burn. A note about the California Olive Oil Council, COOC. Producers in California who belong to the COOC have imposed tougher standards for the Extra Virgin Olive Oil classification than the IOOC. To be certified by the COOC, the maximum acidity level is .5% and the oil must exhibit positive organoleptic characteristics. The Olive Tap supports the goals of the COOC, and will not offer Extra Virgin Olive Oils that exceed the COOC standards. My bottle says Extra Virgin Olive Oil and Balsamic Vinegar. Is there Oil and Vinegar in the bottle I received? No. That is our logo and it says, "Extra Virgin Olive Oil and Balsamic Vinegar Tasting Emporium". The oils and vinegars in our fusti (tanks) do not contain any preservatives. Mixing them will, over time, degrade the flavor and quality of the product. According to many sources, once the EVOO, vinegar and seasonings are combined, the product must be refrigerated and used within 10 days. Are The Olive Tap Oils and Vinegars Gluten Free? Yes, both are 100% guaranteed gluten free. Our Balsamic Vinegars do not contain gluten or any gluten containing additives. Are there any additives, or added sugars in The Olive Tap Extra Virgin Olive Oils and Balsamic Vinegars? No. All of our oils and vinegars are naturally flavored with no additives. Our oils may be infused, or they may contain herbal or citrus oils or other natural flavors. All of our flavored Balsamic vinegars contain either fruit juice, or other natural fruit flavors. There is no added sugar, except that a small amount of sugar is used to make the dark chocolate (cocoa and sugar) that is in our Dark Chocolate Balsamic Vinegar. Why is there a discoloring in my white balsamic? What is Mother in Vinegar? We add no preservatives to our vinegars. They are 100% natural. As a result, you may notice the development of a white stringy substance in the bottom of the bottle. This mass is called “mother of vinegar” and will naturally occur in vinegar products over time. It is mostly cellulose, a natural carbohydrate, which is the fiber found in the juice or wine used to make the vinegar. Vinegar containing a “mother” is not harmful or spoiled. If you find it objectionable, “mother” can be removed by filtering with cheesecloth or a coffee filter. Why is my Olive Oil Cloudy? Olive oils may be cloudy for several reasons. If the EVOO is cloudy it may simply be unfiltered oil and what you are seeing is olive pulp that has not had time to settle. Over time, this pulp will settle to the bottom of the bottle. If your oil has solidified during shipping in cold weather, allowing it rise to room temperature will generally clear up the cloudiness. If after coming up to room temperature there is still some residual discoloration, you may warm the oil in a warm temperature water bath to completely clarify it. Use caution and do not use hot water, as this could affect the quality of your oil. Your oil is not harmed by cold or freezing. What is the Shelf Life of The Olive Tap Extra Virgin Olive Oils and Balsamic Vinegars? For absolute best flavor, our oils should be used within 1 year of purchase. They may last longer than 1 year, but the flavor may be diminished. For Balsamic Vinegars, most producers recommend use within 2-5 years. Again, over time the flavors may diminish, but the vinegar itself will remain good even after this time frame. Can I infuse this oil with fresh herbs? We would highly recommend caution when infusing oils. Improper preparation can be hazardous, even fatal. Several people have become ill and some have died as a result of consuming homemade garlic infused olive oil and food prepared with homemade garlic infused olive oil. According to The Science of Cooking: Olive oil makes a good infusion base for some herbs, but tends to go rancid more quickly than other oils. Keep your infused oils refrigerated. Olive oil will last about a month, other oils will stay fresh for about two months. According to The University of Maine Bulleting #4385: Flavored or infused oils can add excitement and new tastes to your meals. They can be used in salads, marinades, sauces, and dips. But, like many other low-acid homemade foods, infused oils can pose food safety risks. The primary concern with infused oils is the extremely dangerous and sometimes deadly microorganism, Clostridium botulinum (C. bot), which can cause botulism. The fresh vegetables, herbs, and/or fruits used to flavor or infuse oils can be contaminated with C. bot spores. Fresh produce also contains water, which allows bacteria such as C. bot to live and grow. C. bot thrives in an oxygen-free environment like oil. This is why flavored and infused oils must be made and stored correctly to prevent botulism poisoning. While we are not experts, we think you need to be very careful. Homemade infused oils can pose food safety risks, and won’t last nearly as long as our flavored olive oil selections. Besides, Flavored Extra Virgin Olive Oils from The Olive Tap consistently taste better and cost about the same as unflavored Extra Virgin oil, and will ultimately last much longer than home prepared oils. Can I Cook with EVOO? Of course, just watch your cooking temperature and try not to exceed 325-350 degrees. If you overheat Extra Virgin Olive Oil it will burn and ruin your dish. As you can imagine, there are many acceptable cooking uses for EVOO. Just watch how much is used by professional chefs on the food channels. Here is a guideline for using EVOO in the kitchen. We will start with the most basic and work up the heat scale to deep frying. Raw: For using it raw, only the best olive oil will do (100% EVOO). It is great for drizzling over salads, or dipping with fresh bread. Also great drizzled in soups or over pasta, and as a finishing oil. Sautéing: The term sautéing is French and refers to the constant motion of food in the pan. When using Olive Oil for sautéing, pour the oil in the pan and bring the temperature up. When the oil is heated, add the food and stir, making sure the food and oil does not burn. Baking: Olive Oil is a healthy substitution for butter and has been used by the Italians in baking for many years. Often, customers like to use the lighter oils (Manzanillo) or nut flavored oils (Walnut) for use in desserts. For non-dessert baking, Olive Oil can also be used. Depending upon the temperature of the items you are baking and your preferred flavor characteristics, the recommended oil will vary. Pan Frying: EVOO can successfully be used in pan frying vegetables, eggs, seafood and thin slices of meat. The key is to watch your temperature, and limit the use to only those times where the Extra Virgin Olive Oils flavor is desired. Keep in mind, excessive heat and too long at high temperature will kill the exquisite flavor of The Olive Tap’s premium quality olive oil. Deep Frying: In general, EVOO is not recommended for deep frying. It is best to use Pure Olive Oil or Refined Oil. I received a gift basket with Olive Tap Balsamic Vinegar. What do I do with it? Balsamic Vinegar: Balsamic vinegars are excellent for cooking, marinades, sauces, and most commonly salads. Sweeter balsamic vinegars are great for finishing dishes, for desserts, aperitifs, digestives, and sipping. To make a simple dressing, add a teaspoon of prepared Dijon mustard and some minced shallot or garlic to ¼ cup of our Balsamic Vinegar of Modena. While whisking constantly, stir in 1/2 cup of The Olive Tap olive oil. Serve, and refrigerate unused dressing for up to a week. Add garlic, herbs and seasonings to the vinegar mixture before adding oil if desired. Adjust oil and vinegar amounts to suit your personal taste. EVOO: Great when used on salads and in vinaigrettes. Also, use it for bread dipping or finishing a pasta dish. Great when used in marinades or brushed on meats and fish before grilling. Sauté vegetables or toss veggies in EVOO after cooking. For more information, see above, “Can I Cook with EVOO”. What are the typical ratios of oil to vinegar? For marinades we recommend 1 part oil to 1 part vinegar. For vinaigrettes, use 2 or 3 parts oil to one part vinegar. See above for a simple vinaigrette recipe. What are the Nutritional Facts for The Olive Tap olive oil, balsamic vinegar and nut and seed oils? We have outlined nutritional information for our 100% Extra Virgin Olive Oils, Flavored Olive Oils, Nut and Seed Oils, Balsamic Vinegars, Wine Vinegars and Vincottos. Just click on the link below. Can I substitute olive oil for butter? Butter/EVOO conversion… Use this chart to convert the quantity of butter called for in a recipe to the required quantity of olive oil. Is Olive Tap Extra Virgin Olive Oils Kosher? According to our Rabbi consultant, all Extra Virgin Olive Oil is Kosher by nature of production. They are not necessarily “certified” Kosher, unless marked as such. • Small amount before meals lowers appetite. • Tastes great. You will want to eat more healthy salads. How are balsamic Vinegars made? There are several types of Balsamic Vinegar, offered in various price ranges and quality. Unfortunately, mislabeling by many olive oil shops is rampant. If a store attempts to sell you “Traditional”, “18 year”, “25 year” Balsamic Vinegar of Modena, in anything other than a stamped, sealed and boxed Giugiaro design 100 ml bottle (shown below), and at price lower than let’s say $60.00, simply ask them to prove it. Traditional Balsamic Vinegar Of Modena: Traditional Balsamic Vinegar of Reggio Emilia. Also known as Aceto Balsamico Tradizionale di Modena/Reggio Emilia. This is a highly regulated, expensive ($100 and up per 100 ml product) generally made by crushing and cooking Trebbiano grape must/juice reducing its volume approximately 70% to concentrate the flavors. There is no fermentation, and thus Traditional Balsamic Vinegar of Modena has never been a wine product. The balsamic must is aged in a series of gradually smaller wooden barrels of different kinds of wood for at least 12 years to be called Vecchio, or at least 25 years to be called Extra Vecchio. Other than knowing the minimum age of the Traditional Balsamic Vinegar, it is illegal in Italy to label any of these products with an age designation. Anyone labeling a product as Traditional Balsamic Vinegar of Modena and claiming that it is specifically 12, 18, 25, etc. years old is likely attempting to deceive the buying public. Another clue to the deception process is the bottle. By law, Traditional Balsamic Vinegar of Modena comes only in 100ml bottles designed by Giugiaro, and all producers must use the same design. 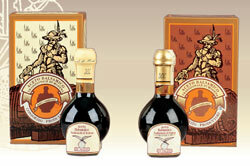 There is a slight difference in the bottle and seal for Traditional Balsamic Vinegar made in Reggio Emilia. Real Traditional Balsamic Vinegar of Modena cannot be used to make a salad; it is too thick and heavy, and will drag your salad greens to the bottom of the bowl. Balsamic Vinegar of Modena: Note the absence of the word “Traditional”. Most, but not all Olive Oil and Balsamic Vinegar specialty shops sell this product. Many misinformed or intentionally deceptive stores add the words “traditional” and some, “traditional style” to their descriptions. These shops will also commonly call them 18 year, 22 year, 25 year old. There should not be any age claims, as their entire existence was to produce them in a short period of time and at a price the average person can afford. Most are aged for less than 1 year, and many are aged a few months. There is no designated bottle. Balsamic Vinegars of Modena are best used in salads and as condiments where a modestly thick/dense product is desired. Rather than aging only pure concentrated grape must the requisite minimum 12 years to reach an appropriate level of acidity, Balsamic Vinegar of Modena is generally made by combining grape must, red wine vinegar, and occasionally caramel color or flavor, and then age their products in wooden barrels for a brief period of time. The best producers and The Olive Tap’s premier producer uses a very high quality grape must, and barrel aged red wine vinegar, with a minimum of a few months up to a year. Others may use poor quality grape must or concentrate, lower quality wine vinegar and natural or artificial color and flavor. Some will add starch or other products to thicken their products artificially. Tasting Balsamic Vinegar of Modena in The Olive Tap stores will provide great insight into the flavor differences between our high quality and other lesser quality Balsamic Vinegar of Modena. Balsamic Vinegar: Note, when properly labeled the words “of Modena” are absent. This is a product that has not been made under the strict standards of Modena, Italy. Ingredients are not regulated and additives and flavorings can be used at the producer’s discretion. Most are very thin and harsh and highly acidic, resembling wine vinegar. They cost much less to produce, but may be priced high to capitalize on the market for and reputation of Balsamic Vinegar of Modena. Do I need to refrigerate my Balsamic Vinegar? It is best to keep the balsamic away from direct heat or light. Due to the acidic content of vinegars it is self-preserving and does not need refrigeration. EVOO should be stored in a closed container, in a cool location away from heat or light. Do not store near the stove or in direct sunlight. You may refrigerate your oil for long term storage, but cannot use it directly from the refrigerator as Extra Virgin will usually solidify at refrigerator temperatures. If you do refrigerate, remove and let it set at room temperature for 30 minutes prior to opening bottle. A good technique for those that do not use a lot of EVOO, is to dispense approximately 100-150 ml. into a cruet or other dispenser bottle, refrigerating what is left. When you have almost used up all the oil in the cruet, take your larger bottle out of the refrigerator, let it come up to room temperature and refill your cruet.